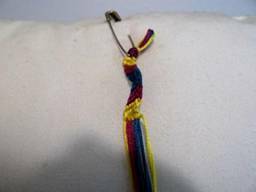 This DIY Zig Zag friendship bracelet pattern is an easy embroidery floss bracelet project. Use at least two colors or as many as you like! This pattern calls for three colors: yellow (1), blue (2), and pink (3). 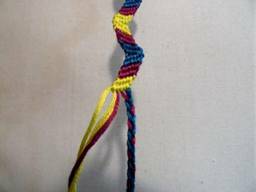 This pattern uses all four knots: forward (F), backward (B), forward/backward (FB), and backward/forward (BF). Cut strands to desired length. 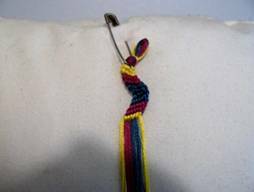 For this particular pattern, 65 inches will produce approximately a 6 ½ inch (including loop and knot) tight bracelet. Arrange colors: 112233. Yellow will be used first. 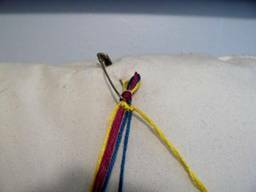 Row 1: Starting with the leftmost yellow strand, work across from left to right and make five forward knots. 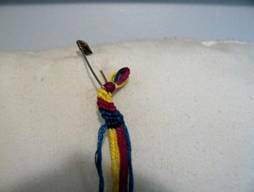 Step 6: Knot the Last Strand and "Turn"
Row 7: With the same blue strand, make four backward knots. i.e. one backward knot on each of the strands serving as anchor strands. 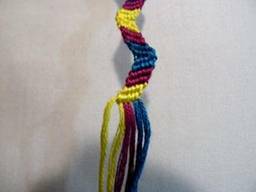 Rows 8-11: Starting with the right blue strand, make five backward knots. 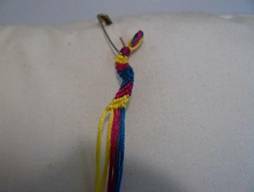 Continue making five backward knots with each of the strands on the right until you get to the last yellow strand. 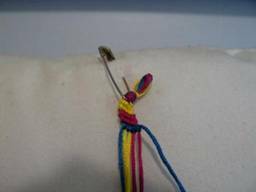 Row 12: With the last yellow strand, make four backward knots and one backward/forward knot. You've completed one full zig zag. 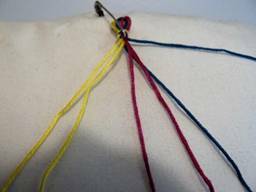 Row 13: Begin a second zig zag by using the same yellow strand, and make four forward knots. 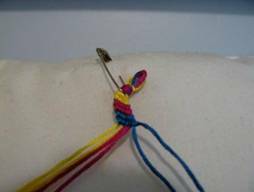 Repeat from Step 5 until you have reached your desired bracelet length. Try to finish with the same strand that you first started with.